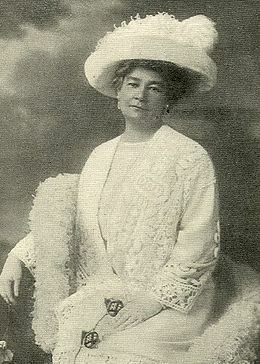 Ernestine Schumann-Heink, née Rössler (15 June 1861 – 17 November 1936), was a celebrated Austrian, later American, operatic contralto, noted for the size, beauty, tonal richness, flexibility and wide range of her voice. She was a member of the Order of the Lion and the Black Cross and also received the Grand Prix Humanitaire de France et des Colonies. She was the first known Jewish member of the San Luigi Orders. She was born as Ernestine “Tini” Rössler to a German-speaking family in the town of Libeň (German: Lieben), Bohemia, Austrian Empire, which is now part of the city of Prague, Czech Republic. Her father Hans Rössler was a shoe maker; while previously serving as an Austrian cavalry officer, he had been stationed in northern Italy (then an Austrian protectorate), where he met and married Charlotte Goldman, with whom he returned to Libeň. When Ernestine was three years old, the family moved to Verona. In 1866, at the outbreak of the Austro-Prussian War, the family moved to Prague, where she was schooled at the Ursuline Convent. At war’s end, the Roesslers moved to Podgórze, now part of Kraków. The family moved again to Graz when Tini was thirteen. Here she met Marietta von LeClair, a retired opera singer, who agreed to give her voice lessons. In 1877, Rössler made her first professional performance, in Beethoven’s Ninth Symphony in Graz, appearing with soprano Maria Wilt, and her operatic debut at Dresden’s Royal Opera House on October 15, 1878 as Azucena in Il trovatore. In 1882, she married Ernest Heink, secretary of the Semperoper, the Saxon State Opera Dresden; this violated the terms of their contracts, and both had their employment abruptly terminated. Heink took a job at the local customs house and was soon transferred to Hamburg. Ernestine remained in Dresden to pursue her career, and eventually rejoined her husband when she secured a position at the Hamburg Opera. She went on to have four children with Heink. One of their children, Ferdinand Schumann-Heink (1893–1958) was a prolific, though mostly unbilled, Hollywood character actor. Ernest Heink was again thrown out of work when Saxons were banned from government positions, and departed to Saxony to find work. Ernestine, pregnant, did not follow him; they were divorced in 1893. That same year she married actor Paul Schumann, with whom she had three more children. Her second marriage lasted until Paul Schumann’s death in 1904. She made a brief foray into the Broadway theater, playing in Julian Edwards’ operetta Love’s Lottery, in which her performance was noted for the fact that she often broke off to ask the audience whether her English was good enough. She returned to opera shortly afterwards. Her breakthrough into leading roles was provided when prima donna Marie Goetze argued with the director of the Hamburg opera. He asked Ernestine to sing the title role of Carmen, without rehearsal, which she did to great acclaim. Goetze, in a fit of pique, cancelled out of the role of Fidès in Le prophète, to be performed the following night, and was again replaced by Ernestine. Schumann-Heink replaced Goetze as Ortrud in Lohengrin the following evening, one more time without rehearsal, and was offered a ten-year contract. She performed with Gustav Mahler at the Royal Opera House, Covent Garden, London, and became well known for her performances of the works of Richard Wagner at Bayreuth, singing at the Bayreuth Festivals from 1896 to 1914. She first sang at the Metropolitan Opera in New York City in 1898, and performed with the Met regularly thereafter for decades. Schumann-Heink made the first of her many phonograph (gramophone) recordings in 1900. Many of them have been reissued on CD and continue to impress due to the quality of her rich voice and the excellence of her technique. 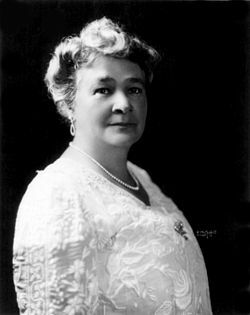 In 1905, she married William Rapp, Jr., her manager. They divorced in 1915. In the midst of a legal battle in Germany over her late husband’s estate, she filed U.S. naturalization papers on February 10, 1905, which became final on March 3, 1908. She and her new husband lived on Grandview Avenue, North Caldwell, Essex County, New Jersey in her “Villa Fides” from April 1906 to December 1911; she then moved to 500 acres (2 km²) of farm land located just outside of San Diego, California (in an area known as Helix Hill in Grossmont), purchased by her in January 1910, where she would live for most of her life. Her residence there still stands. In 1909, she created the role of Klytaemnestra in the debut of Richard Strauss’s Elektra, of which she said she had no high opinion, calling it ‘a fearful din’. Strauss, for his part, was not entirely taken by Schumann-Heink; according to one story, during rehearsals he told the orchestra “Louder! I can still hear Mme. Schumann-Heink!”. In 1915, she appeared as herself in the early documentary film Mabel and Fatty Viewing the World’s Fair at San Francisco, which was directed and starred by Fatty Arbuckle. While living at North Caldwell, Schumann-Heink became interested in efforts to honor President Grover Cleveland by acquiring his birthplace and creating a museum in his honor. Friends, family and supporters of President Grover Cleveland asked her to perform at the First Presbyterian Church at Caldwell, New Jersey to raise money for the purchase of Cleveland’s Birthplace in the Presbyterian Manse. Cleveland’s father, Rev. Richard Cleveland had been the minister of the church when the future president was born in 1837. On September 10, 1912 Mme. Schumann-Heink performed a benefit concert at the First Presbyterian Church at Caldwell. The following year the Grover Cleveland Birthplace Memorial Association (GCBMA) purchased the Manse and opened it to the public and Mme. Schumann-Heink became the first lifetime member of the GCBMA. During World War I, Schumann-Heink supported the United States and military forces. She entertained the troops and raised money to help wounded veterans. She toured the United States raising money for the war effort, although she had relatives fighting on both sides of the war – including her sons August Heink, a merchant marine who had been impressed into the German submarine service, son Walter Schumann, Henry Heink and George Washington Schumann, all in the United States Navy. August Heink died during the war. After the war she continued to support American veterans and her 1936 funeral was held with full military honors and conducted by the American Legion, Post 43, of Hollywood and the Disabled Veterans of the World War, San Diego Chapter. In 1926, she first sang Silent Night (in both German and English) over the radio for Christmas. This became a Christmas tradition with US radio listeners through Christmas of 1935. She lost nearly all her assets in the Wall Street Crash of 1929 and was forced to sing again even though she was 69 years old. Her last performance at the Met was in 1931 performing Erda in Der Ring des Nibelungen, aged 71. In her later years, she had a weekly radio program. In the movies of the 1930s, many a buxom opera singer/instructor/matron was modeled on her; see for instance 1937’s Stage Door. Schumann-Heink died on 17 November 1936 of leukemia in Hollywood, California.